Amber Stevens West wears optical white high top Converse All Star “Chuck Taylor” sneakers in the series. Maxine and Jerrod in Cynthia’s kitchen. The American sitcom has been a tried and true staple of television for the past 70 years. Over that time, few shows have come along to break that mold or change the status quo. Even fewer have used the half hour they spend on your TV screens to really talk about the current events and social issues of the times. 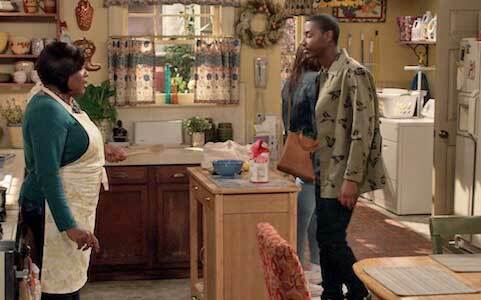 NBC’s The Carmichael Show has changed the conversation on what it means to be a modern TV sitcom over its three season run on primetime, and has showed that it is possible to talk about real life problems in 30 minutes or less. Maxine checking out what’s in Cynthia’s fridge. 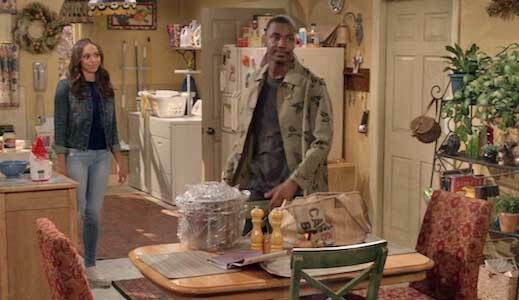 The show revolves around Jerrod Carmichael (the creator of the show, playing a fictionalized version of himself) living with his girlfriend Maxine (Amber Stevens West). Maxine, being a bit of a fashionista, has a varied wardrobe, and wears white chucks in a few episodes. Jerrod has a very close relationship with his family, and much of the show focuses on the dynamic between them and him and Maxine. Jerrod’s family are actually based and named after his real family, and include patriarch Joe (David Allen Grier), mother Cynthia (Loretta Devine), older brother Bobby (Lil Rel Howery), and Bobby’s ex-wife Nekeisha (Tiffany Haddish). Amber Stevens West wears chucks both on and off the set. The show tends to follow a similar format each episode. Maxine and Jerrod usually end up at Jerrod’s parent’s house, where they end up talking about a current event or relevant social issue. The show differs from most sitcoms in that there are extended conversations about real life issues that are held for the entire length of the show, rather than the typical quirky situation that is solved in a half hour or less. This may seem like it can become boring and played out, but the show avoids that pitfall with its use of witty dialogue, and interesting difference of opinions between the family members. This makes the show feel less like a sitcom, and more like a typical Sunday night at any American household. These are conversations family have all the time, and to have them played out on television is refreshing. The show also differs from traditional sitcoms in that there is never a “B plot” side story fro characters that aren’t involved in the main plot. We, the audience, focus on one conversation a week just like the family, and in that sense The Carmichael Show is truly original. 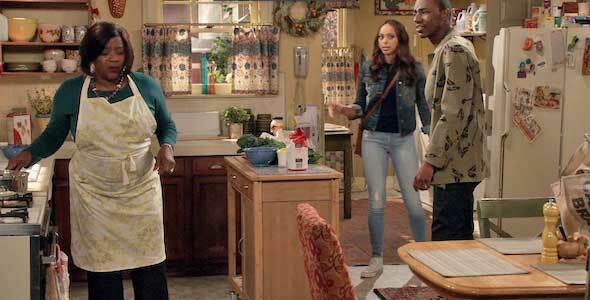 Maxine wears optical white chucks in Season 1 of The Carmichael Show. The series’ first two seasons are currently on Netflix, with the third and final season just finishing up its run on NBC. Some key episodes to seek out are their episodes about the Bill Cosby scandal (“Fallen Heroes”), the Black Lives Matter Movement (“Protest”), mass shootings (“Shoot-Up-Able”), and the use of the n-word ("Cynthia's Birthday"). This show is definite watch for those looking for a different kind of sitcom that highlights real issues through conversations you may have in real life. Jerrod and Maxine attempt to get Cynthia and Joe to eat healthier in the Season 1 episode “Kale”.